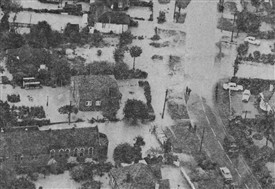 In September 1968, tremendous storms over an autumn weekend left the villagers of Hullbridge isolated when floods caused by the unprecedented amount of rainfall over a short period cut off access roads. The caravan site adjacent to the river Crouch was also inundated as a result of the downpour to the extent that parked cars all but disappeared. Many homes were flooded and rowing boats had to be used to rescue home owners. Even at the top of the hill in the centre of the village storm drains were unable to cope with the amount of water in such a short period and in many places home owners had an anxious time wondering if they would be able to hold back the floods. (Daily Mirror). Shortly after these events and others of a similar nature, a pumping station was built at Watery Lane and another under the A127/A130 junction with the aim of preventing similar floods in future. This page was added by Sue Horncastle on 01/01/2012. I remember paddling in the flood water under the bridge at Rectory Road, Hawkwell, which spread up across the junction with Magnolia Road. After that they improved the drains and as far as I know it has never filled up like that again. I remember that weekend of the floods. I was returning from working in Southend on the Saturday and the bus stopped at Coventry Corner as Ferry Road was too flooded to continue to the river. Also, my friend returned home that day with her new-born twins to find her husband bailing out the kitchen. My aunt in Lincoln was worried about us as the floods had made the national press.